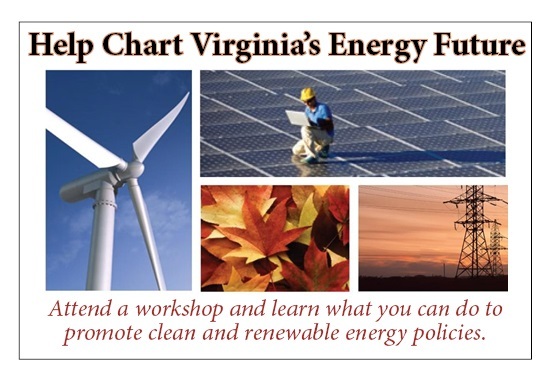 Please join the Virginia Conservation Network, the Virginia League of Conservation Voters Education Fund, Virginia Sierra Club and our local partners as we explore Virginia’s path to a clean energy future. Most importantly you can find out what you can do to promote clean and renewable energy policies here in Virginia. Our discussion in Richmond will focus on climate change and what Governor McAuliffe must do to reduce carbon pollution. The Governor has one year to develop a strong energy plan that will effectively reduce carbon pollution to meet federal standards. These standards are just what Virginia needs to push forward energy efficiency and renewable energy. Find out how this came to be and what you can do to ensure Virginia has a strong plan for clean energy. FOR COMPLETE DETAILS OF AGENDA, OR TO REGISTER, CLICK HERE.